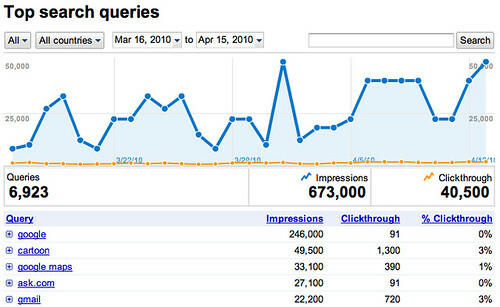 Google has wowed webmasters with a new feature just added to Google Webmaster Tools, the Top Search Queries report. 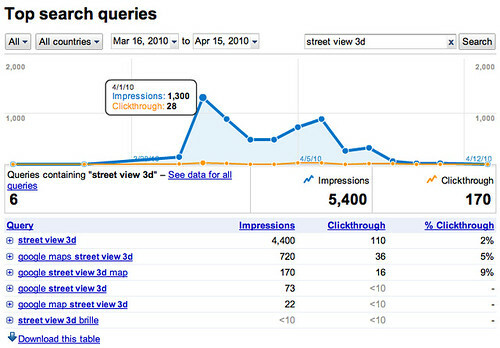 Not only did Google add more queries and neat charts, they also added impressions, clicks and click through rate data - yes on the organic search results. Not only does this really trump keyword ranking reports, but it also unveils how important being in the top three positions on Google.com. First let me show you an abstract of the reports for this web site. It is pretty revealing looking at the CTR between the 1st, 2nd, 3rd and then lower positions. The most interesting webmaster information published to date. Seriously, A++ move on Google's part. Forum discussion WebmasterWorld, Google Webmaster Help and DigitalPoint Forums.